With the preamble out of the way, let’s dig into just how this new Apollo Lake platform does perform. The Chuwi LapBook 14.1 features the Intel Celeron N3450, which is a quad-core CPU, which runs between 1.1 GHz and 2.2 GHz. There is no Hyperthreading available. There is 4 GB of memory, and Intel HD graphics 500, which is Gen 9 graphics with 12 execution units. The GPU runs between 200 MHz and 700 Mhz. With a 6 W TDP, and 4 W SDP, there is no fan required. To measure performance, the LapBook was run through our typical set of tests, and for comparison several other devices were selected to get a good representation of where the LapBook fits in. 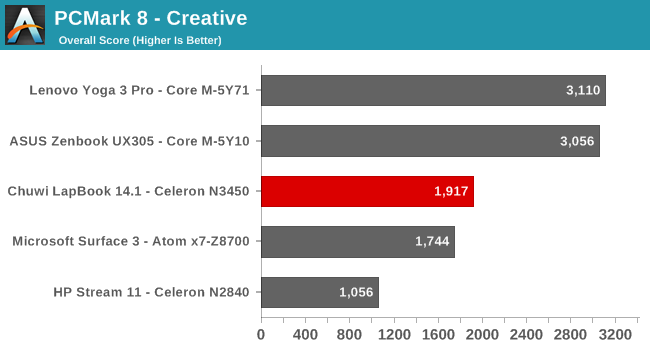 The HP Stream 11 is the Celeron N2840, which is a dual-core Bay Trail-M offering, and when it was tested it was $199. 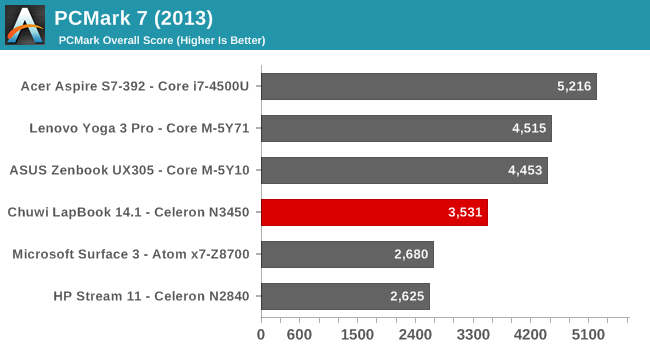 The 2017 model is still a dual-core, but Braswell based with the N3050, so the LapBook should have a big advantage with twice as many cores. We don’t get a lot of less expensive devices, so we’ll also see the ASUS UX305, which features a Broadwell based Core M 5Y10, and Lenovo Yoga 3 Pro with Core M 5Y71, for comparison to a slightly older 4.5-Watt Core M part. Also, the Microsoft Surface 3 features the fastest Cherry Trail Atom x7 available at that time, which is a quad-core Airmont part, but with a 2-Watt SDP. The Razer Blade Stealth is a thin and light 15-Watt Core product, and although it’s quite a bit more expensive, it’s a good comparison for a modern Ultrabook performance versus the latest Atom. 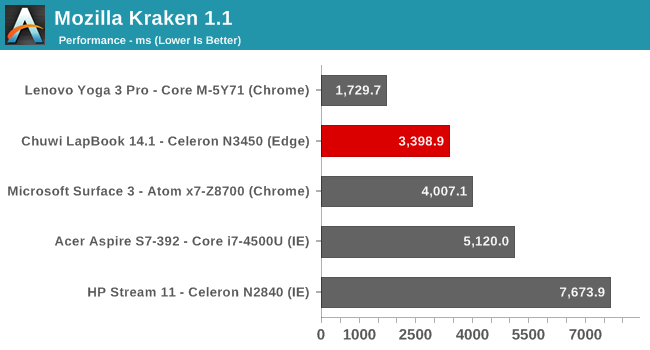 Finally, I’ve selected the Acer Aspire S3, which is an older Core i7-2637M processor, to see how the latest Atom fares against older Core, and the Acer Aspire S7 with Haswell Core i7-4500U. Clearly, the HP Stream 11 will be the most relevant comparison, but since we get so few of these low-end devices in, it will be good to see where they fit, especially if you are thinking of replacing an older notebook. We don’t have full results for some of the older devices, since testing methodology changes over the years, but if you’d like to compare the Chuwi LapBook 14.1 against any other device we’ve tested, please check out our online Bench. PCMark is an all-in-one benchmark, which tests all aspects of a system, including CPU, GPU, and storage. It tries to use real-world tests, which will stress burst performance by the processor, as well as some more demanding longer duration tests. The new Goldmont cores, paired with Gen 9 graphics, have certainly moved the bar forward for Atom. The performance is quite a bit better than the HP Stream, although that is just a dual core device, but it’s also well ahead of the Microsoft Surface 3, which has a quad-core Cherry Trail X7-Z8700, but with a 2-Watt SDP compared to the 4-Watt SDP in the Apollo Lake. 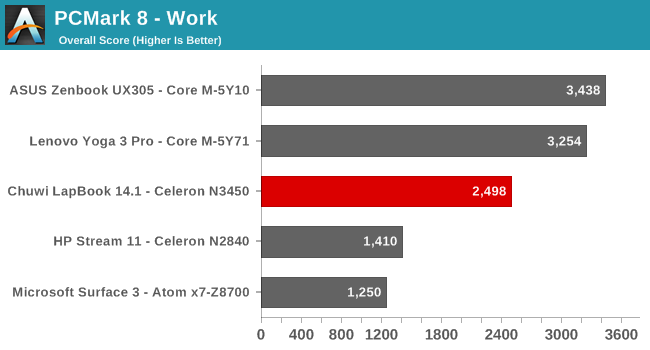 But even if you compare it to the Lenovo Yoga 3 Pro, with Core M-5Y71, the Chuwi offers about 70% of the performance of this in PCMark 8. Granted the Yoga 3 Pro was not the most performant Core M system, but still, it’s a decent result, when you consider the Chuwi costs about 25% of that device. Cinebench is a pure CPU test, with higher performance cores, and multiple cores, giving much more performance. 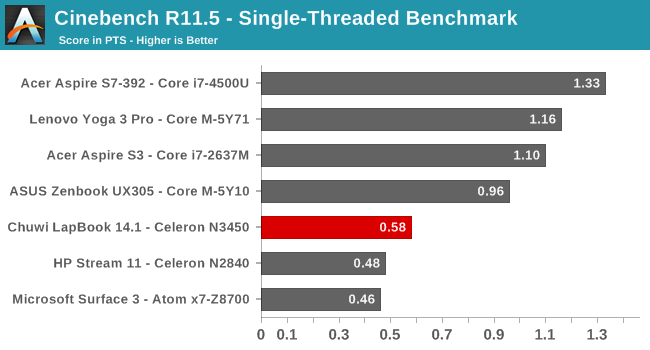 Here we can see the jump in single-threaded performance from the HP Stream 11 with it’s Bay Trail-M Silvermont cores, and the Chuwi LapBook with it’s Goldmont cores. 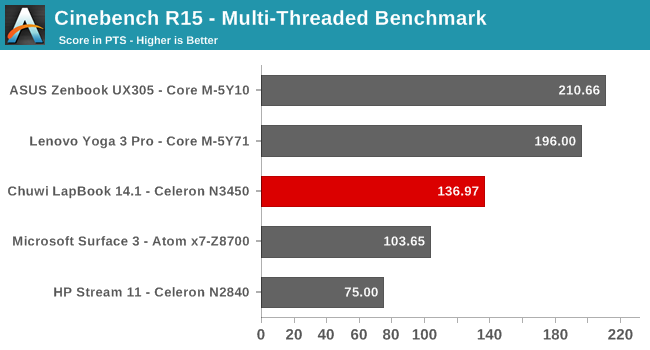 Of course, the jump is even higher on the multi-threaded tests, since the Chuwi has a quad-core CPU rather than the dual-core in the HP Stream 11. 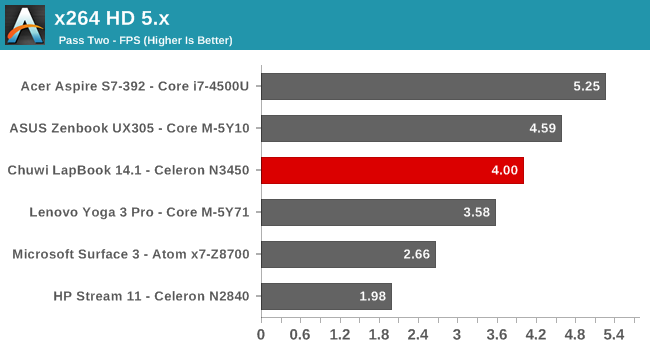 It’s tougher to get a proper picture compared to the Airmont powered Surface 3, since that tablet SoC has half the scenario design power, but, the performance over the X7-Z8700 is significant. 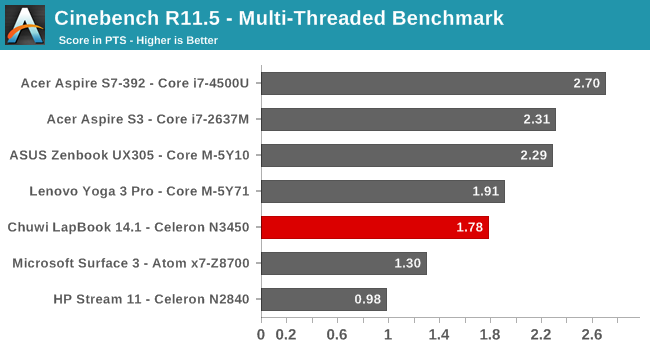 Once again, the Core M powered devices walk away from Atom here, as do the older higher TDP Core i7 in the two Acer models. Much like Cinebench, x264 encodes a movie using the CPU, so this is a pure CPU test. The results are also much the same as Cinebench, but it’s interesting to note the Chuwi LapBook has passed the Core M powered Lenovo Yoga 3 Pro on pass two. 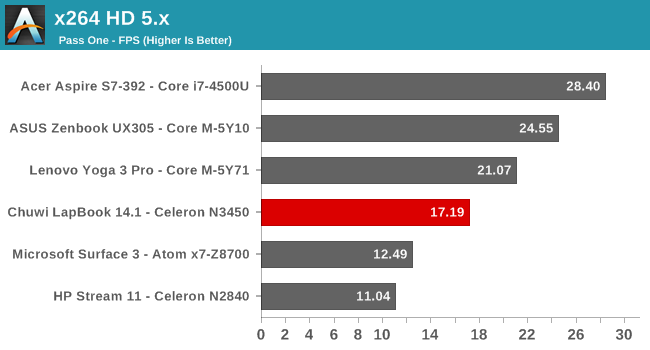 The Yoga 3 Pro had some serious thermal issues, and Lenovo chose to limit the CPU temperature despite having a fan in the device, but it’s still impressive to see a Goldmont CPU perform better than a Broadwell CPU. Here the Chuwi LapBook scores 87% of the ASUS UX305, which was a solid performing Core M machine, despite it having the slowest Core M available in the Broadwell era. Testing the web performance is important because it’s arguably the most-used application on any PC. It’s worth pointing out again that all of our web performance testing prior to Windows 10 was done on Google Chrome, and the browser can have a more significant impact on the overall score than the CPU. When Microsoft Edge came along, offering performance that equalled or passed Chrome, we made the switch back to the stock browser. 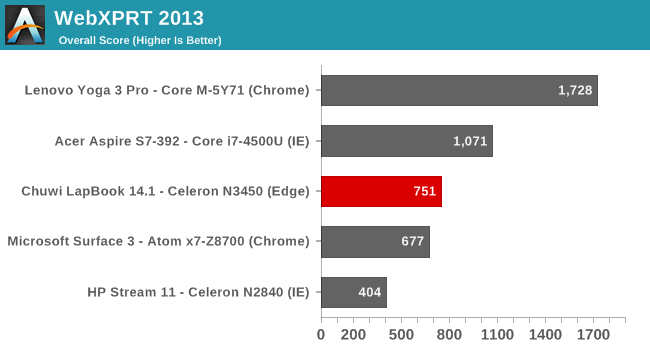 The exception here is the Acer Aspire S7-392, which was tested with Internet Explorer. Take these scores with that knowledge. 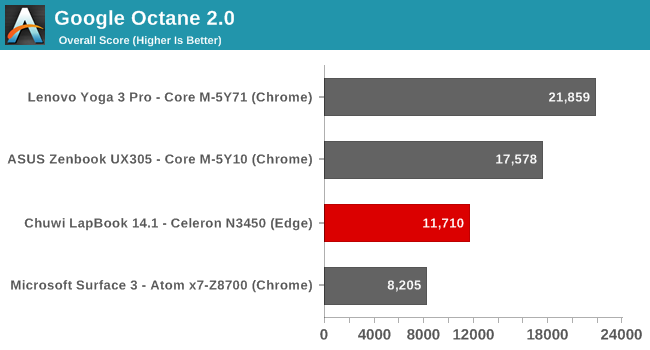 In all the tests, the Chuwi outperforms the Microsoft Surface 3’s Atom CPU, and is much quicker than the HP Stream 11, even with the browser differences. 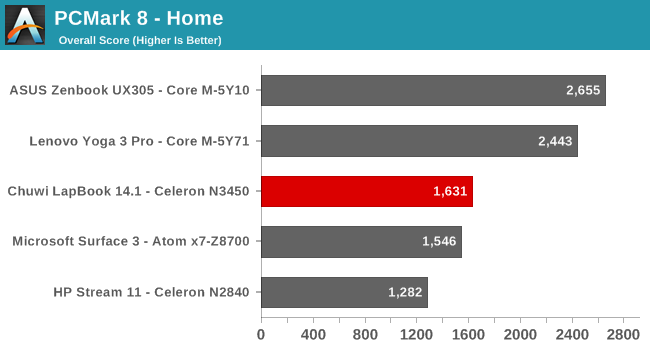 It can’t compete here with Core M, especially the Yoga 3 Pro which has the highest boost frequency, but compared to older Atom devices, it’s a nice step forward. It remains to be seen what will happen to Atom going forward, but for now, we can take a look at the latest Intel Apollo Lake platform with a quad-core Goldmont CPU. The step forward with Goldmont is significant, which bodes well for the platform, but it’s difficult to say if this will be enough with increased competition coming in the near future. Day to day use of the Chuwi LapBook was typical of any Atom powered device, in that it feels a bit slower than I’m used to, but the experience is not terrible. 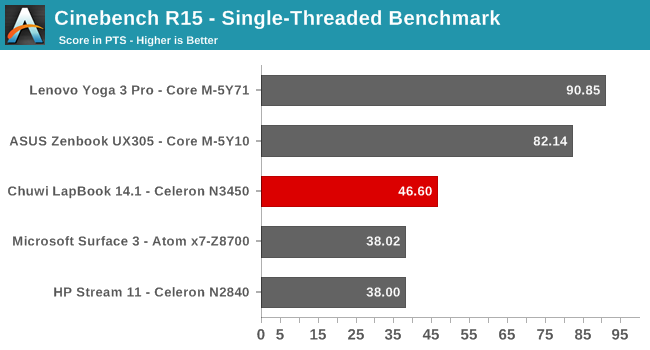 The fact that it provides about 70% of the performance in PCMark 8, compared to the Yoga 3 Pro, is quite remarkable, for a device that costs less than 25%. This would be difficult to use as a main computer for anyone, but if you need a portable computer on the cheap, the performance is not too bad.